Thanks to a WalMart gift card I received for Christmas from my family, I was able to purchase a beautiful new TV hutch (and thanks to my parents I received a fab new TV for my 30th birthday which now resides on said hutch!!). I love the overall look but wasn't in love with seeing all my junk behind the clear glass panes. Having a place to store 'junk' is particularly important upon just moving in and needing time to slowly go through and organize each room. 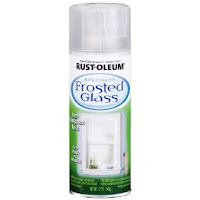 The easy solution was purchasing a can of frosted glass spray! After removing each pane from its respective door, I used about 5 coats to get as even a finish as possible. Now, you can only see slight changes in color behind the glass, but certainly can't make out what kinda junk I have behind those doors! A little frost in August is a good thing! Great idea, Heather! I'm going to use contact paper to 'frost' my front door!